توجه به انرژیهای تجدیدپذیر به عنوان جایگزین انرژیهای فسیلی، باعث توسعه علمی و فنی کشورهای مختلف در این زمینه شده است. دانش انرژیهای تجدیدپذیر شامل مجموعه‌ای از علوم و فنون مهندسی است که ماهیت میان رشته‌ای آن‌را آشکار می‌کند. با توجه به گستردگی منابع تجدیدپذیر مانند انرژیهای خورشیدی، باد، زیست توده و زمین گرمایی در ایران، گسترش آموزش و پژوهش به همراه صنعت و فناوری در این زمینه امری اجتناب ناپذیر است. 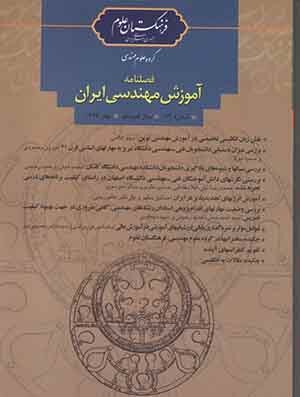 در این مقاله، ابتدا ضرورت آموزش انرژیهای تجدید‌پذیر به عنوان یک رشته میان رشته‌ای و با توجه اهداف سند جامع علمی کشور، یعنی تربیت نیروی انسانی توانا در تولید علم و فناوری، مورد بحث قرار می‌گیرد. سپس، مروری بر تجارب و برنامه‌های آموزش انرژیهای تجدید‌پذیر در چند کشور جهان و مقایسه‌ای با برنامه‌های در حال اجرا در دانشگاههای ایران صورت می‌گیرد. در پایان، راهکارها و پیشنهاداتی در زمینه آموزش انرژیهای تجدید‌پذیر که توسعه پایدار را در پی داشته باشد، ارائه می‌شود. 1Assistant Professor, Department of Mechanical Engineering, University of Shahreza, Tehran, Sahreza. 2Professor, Department of Mechanical Engineering, Isfahan University of Thechnologhy, Iran. Renewable energies as an alternative energy of fossil energies causes scientific and technological development in many countries. The science of renewable energy includes various types of science and technologies that proofs the interdisciplinary nature of renewable energy education. Various types of renewable source, i.e. solar energy, wind energy, biomass and geothermal energy, can be found in Iran which implies the importance of renewable energy education and research in Iran. According to Iranian Science, Technology and Innovation Map, renewable energy education consider as one of the interdisciplinary program to train educated people in this field. In this paper, the renewable energy education programs in Iran were criticized. A comparison between renewable energy education programs in Iran and other countries was made. The current state of renewable energy education in Iran seems to be inadequate and it should be expanded and strengthened. Some suggestions were given to improve renewable energy education programs in Iran.